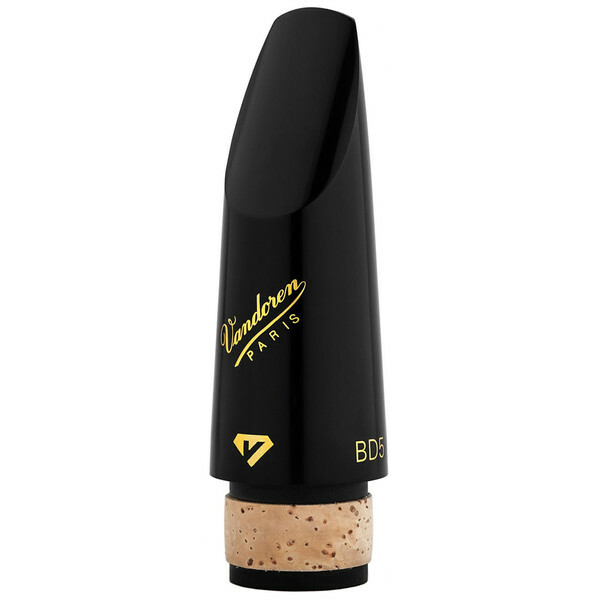 The Vandoren BD5 Black Diamond Clarinet mouthpiece is the latest mouthpiece to be developed in conjunction with professionals, to produce one of the most versatile mouthpieces on the market today. With a brand new internal and external design, this mouthpiece produces a warm and full bodied sound with an even response throughout all registers of the instrument. Whilst remaining incredibly free blowing, the mouthpiece provides a rich compact and dark sound which will help any performer find their own unique tonal character. The BD5 Mouthpiece is of innovative design, whilst taking inspiration of the legendary mouthpieces of the past. With a medium long facing and medium small tip opening, this mouthpiece provides powerful projection within all registers, whilst keeping a hold of its tonal clarity. The BD5 is a highly expressive mouthpiece allowing the most quiet pianissimo's to the most violent Fortissimo's while remaining full and warm, making it the professionals choice for both solo and ensemble work.